No matter what happens in the rest of his life, 2005 will be a year that Alex Clayton will never forget. After all, how often is a 17 year old boy featured in a movie, the winner of a Grand Slam event & a National Claycourt Championship, and a hitting partner for the United States Davis Cup team? Only once in a lifetime. The Zoo, as it's been tentatively titled, is the brainchild of Jim Courier. Though details of the film have been locked up tighter than the Pentagon, it is well known that filming began at the Orange Bowl and ended at the Boys' 18 & 16 Nationals, better known as just Kalamazoo -- or The Zoo. Alex Clayton was one of the boys featured in that film. Though he wasn't picked originally, Alex proved to be more than a fitting candidate to follow as he played his best tennis for the camera (or did the camera bring on his best tennis?). It was a year full of top four finishes for the Floridian that culminated with an incredible summer. Alex took the Boys' 18 singles title at the USTA National Claycourts. It was the first USTA gold for a player who had come so close through years of events as his ranking remained around in the top 20 nationally and top 50 internationally. He played all around the world this year with great doubles results as well (finals at Trofeo Bonfiglio, semis at International Spring Championships, semis at Australian Open), but he couldn't grasp that title -- until he got to the U.S. Open. On September 10th, Alex Clayton teamed with Donald Young to win the Junior Boys Doubles title at the U.S. Open Championships. It was an incredible match that culminated in a "touch" call for match point at 7-6(3),4-6,7-5. 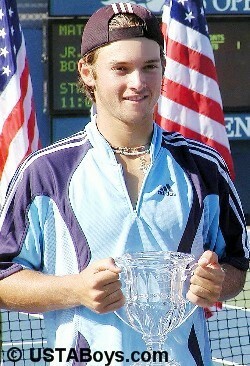 Suddenly -- in one summer -- Alex had a trophy from a Grand Slam to put next to his National Gold. I sat down with an exhuberant Alex Clayton at the U.S. Open. He was certainly one of the happiest players on earth as he had learned in the middle of all the excitement that Patrick McEnroe had chosen him (and Sam Querrey) as Davis Cup hitting partners.